* URANUS in ARIES retro to direct Dec 29: Expect the Unexpected. Wake-up Calls and Awakening. Emergence of the NEW. From the ‘9’ Year to the ‘1’ Year. It already started: December and January are quite the ‘URANIAN’ months as URANUS changes direction from retro to direct – today! URANUS, the Archetype of Prometheus the Awakener, catalyzes liberation on all levels (“I’m out of here!” “Get outa here!” “Eureka!”), and ‘out of the Box’ / ordinary / norm experiences, surprises, shocks, incidents, accidents, precedents, wake-up calls, paradigm shifts, unsettled energy, a sense of urgency / emergency, unrest, and revolutions. URANUS is the ‘higher octave’ / transpersonal version of MERCURY. We’re experiencing now a synchronized, compounding effect of URANUS and MERCURY influences, since MERCURY’s ‘Day of Enlightening Insight’ – the half-way point of the M-r phase, was just yesterday Dec 28. That’s when M-r shifts from the first half, called ‘epimethean’ phase (where ‘old stories’ are being processed) to the ‘promethean’ phase where new ideas and ‘forward-thinking’ is ‘in the air’, and URANUS goes direct today – all in one ‘package’. I don’t know where this poster comes from, or whether the quote is really by Socrates. But it expresses the ‘Zeitgeist’ of URANUS in AR / PLUTO in CAP so well and simply. Since July 29, UR has been in its yearly 5-month retro (inward-backward oriented, or rather latent) phase. Now it’s Wake-UP time: Inner liberation – maybe a breaking away from old beliefs or limiting containers – has prepared us for actually showing our liberated Self more outwardly in our actions and choices. SATURN in SAG helps with being done with ‘old ways / stories / beliefs’ while JUPITER in LI shows how important choices, balance, fairness, reciprocity, right relationship, and ‘good matches’ are. JUPITER in LI is also opposing URANUS in AR (was exact only 3 days ago, Dec 26): Being in our liberated Self and ‘enlightened self interest’ (UR in AR) benefits our relationships and attracts a suitable match – on all levels. UR goes the furthest back in the Zodiac this year now (up to 20°33 AR). If you have planets between about 18 and 23° AR, CAN, LI, or CAP you’d get the kick from URANUS to be the liberated, authentic Self (even if there might be an apparent conflict with family, partners, society – but that’s just part of the path to freedom). Dec 2016 – Jan 2017 is therefore a very charged time that once again pushes us into new levels of RE-birth, transformation, and awakening of consciousness. The NEW is emerging NOW. And a New Year is around the corner. So many people are ‘done’ with 2016, for different reasons. 2016 has been a ‘9’ year, numerologically: 2+0+1+6 = 9. Endings, closure, release. And it feels very ‘old’ already. A lot of what came up this passing year needed to ‘come out’ to be released, perhaps of the last 9 years even (since the beginning of 2008). Doing an intentional ceremony would be a good way of honouring what we let go of. 2017 will be a ‘1’ year: 2+0+1+7 = 10 / 1. Newness on many levels. Stay tuned. Things can shift fast now. What’s the newness that you invoke? * CAP New Moon / New MERCURY Dec 28 / 29, close to PLUTO: BE the Change, as the Power is IN You! Snowy Log Heart – photo by Melanie, 2015 and timeless. Seems like TIME has a ‘life of its own’ – Christmas was only a few days ago – somehow seems like ages – for you too? The sacred time of year that marks the Return of the Light and how / what that reflects in ourselves. The CAP SUN is now in our Northern Hemisphere from Earth perspective ‘climbing’ again in the ecliptic (slightly ‘higher’ every day), and the daylight is gradually increasing, daily a minute or so for now, in the cold of Winter, and eventually, from Feb on, exponentially more. Likewise, CAP energy is fueled by the spirit of gradual, grounded, consistent building and ‘climbing’, persevering, enduring, being prepared and equipped, on the ‘way up’. Does that mean: ‘when the going gets tough the tough get going’? Or is that another myth of glory-through-hardship? For the time being, we still live in a world of collective CAP ‘stories’ and history imprints that PLUTO (since 2009, for the first time in CAP since the late 1700’s) brings up for transformation. With PLUTO, it often ‘gets intense as it changes’. The imperialistic and capitalistic framework of modern societies has produced a huge mountain of redundant stuff that the Earth is not capable of ‘digesting’, obviously, without serious ‘side effects’. And the paradigm of being motivated by and gaining status through ‘ownership’ (a BIG one) is so ingrained in our external reward-conditioned minds (“It’s worth working long hours – maybe not in a soulful way – to earn $$$ and time for the holidays, retirement, or other incentives, and to ‘show your value(!)’. Very apropos the TAURUS undertone of mid-CAP where PLUTO is now (until 2018), and where MERCURY retro has started out from on Dec 19, to release ‘old stories’. This CAP NEW MOON and ‘NEW MERCURY’, near PLUTO (the MOON will pass PLUTO tomorrow Dec 29, the SUN will pass PLUTO on Jan 6) is a powerhouse – offering RE-generation and RE-empowerment from within. MERCURY retro in CAP helps us free ourselves from inner subconscious mental ‘shoulds’ and ‘supposed to’s’, and from our ‘hang-ups’ with leadership and authority (theirs and our own). So that our mind is less cluttered, and we are more clear to do the work we’re born to do! Today’s / tomorrow’s CAP NEW MOON marks the release and closure not only of a monthly cycle (as every NM does), and of the year 2016 that was fraught with collective anger, frustration, defeat, but on a much bigger scale punctuates the epochal changes of structures and hierarchies that we see under PLUTO in CAP. I woke up some day with the question: “Who owns the land?” – and how that’s related to my ancestry and my life experience. Definitely relevant for the CAP New Moon / NEW MERCURY / PLUTO in mid-CAP. To me, what essentially counts (whoever was the messenger) is that it is its profound prophetic advocacy for living with the land and in respect for the Earth. Of course, the actual author needs to be honoured, yet, is a speech for humanity ‘owned’ by anyone? Here is a beautiful video adaptation with voice and photos from Finland, to add another layer of fusion. Simple, yet not always easy questions to ask, in our modern ‘matrix’ – which is changing rapidly. SUN / PLU / MER in CAP remind us that every action from the spirit of integrity, aligned with core truth and basic common sense contributes energetically, and empowers immediately. Let’s honour, and work with resources (incl. inner hidden, buried, and unused ones, says MERCURY retro in CAP, going back over the ‘Integrity Point’ into late SAG, before re-entering CAP and passing PLUTO), and build in quality consciousness. A ceremony to mark the transition from the old to the new consciousness, to re-build from new insights, and to invoke universal power (PLUTO) would be very apropos this New Moon. Just as Nature is ever transforming, simple, essential Soul Power transforms the old, outlived and unsustainable and ‘re-purposes’ the energy for the NEW. To be consciously ‘with it’ catalyzes change that’s due now. SUN / MOON / MERCURY retro (that’s what a New Moon / New Mercury alignment looks like), and PLUTO nearby (the MOON will pass PLUTO tomorrow Dec 29, the SUN on Jan 6, and MERCURY on Jan 29). Simple Soul Power. The Power is IN us, as we connect with Spirit, and speak from that place. Resources to sustain us are there – just a matter of allocating them. The New Moon / MERCURY in CAP is also in trine with the North Node in VIR – it helps to be specific and sort out what the issue is, what works for you and your integrity and what doesn’t. Planting seeds for a new ‘operating system’ with awareness and integrity. As MERCURY retro met the SUN today Dec 28, just before the CAP New Moon: It’s time for new breakthrough insights that move us forward. More about the MERCURY retro phase, tips & tricks in my Astro~News blog post from Dec 13. JUPITER in LIBRA opposes stationary URANUS retro in ARIES: The ‘wild card’ / revolutionary / unpredictability factor of URANUS in ARIES needs some calming and moderation. And the tendency of JUPITER in LIBRA to be overly other-oriented can benefit from some fresh ‘enlightened self interest’ and pro-active ARIES initiative. SATURN in SAG trines URANUS stat in AR (was exact on Christmas eve, Dec 24, and again, for more integration on May 18 and Nov 11, 2017): Ahh, that alignment makes it much easier – and spacious! – to be in our truth and on our path, matured from old beliefs, conditioning, moralizing, and guilt-tripping ‘shoulds’. Free to show up in our authentic Self – hallelujah! SATURN in SAG squares CHIRON in PI (exact Dec 28, and again Apr 30 and Nov 2, 2017): Let go of what weakens you, and move with the YES! South Node in PI, with NEPTUNE / MARS (exact contact on Dec 31 / Jan 1): A dynamic wave – so much coming ‘at us’ or to ‘take in’. Be the ‘enlightened’ surfer – you can’t control the waves but you can learn how to surf. Releasing and moving forward, rolling with the ever-changing. Blessings for the Capricorn New Moon, dear Reader! Next up: URANUS turning from retro to direct tomorrow, Dec 29 – blog post to follow! Holiday Greetings, dear Astro~News Friends! As 2017 is nearing, and MERCURY retro in CAP gives an incentive to be organized – here’s the no-frills overview of DATES for Eclipses, New Moons, and significant motions, by planet. Maybe you’d like to learn the Foundations of Astrology in 2017? We have space for you in our 5-week class that starts on Jan 5 (participation in person or via skype / messenger)! Aug 21: LEO / Solar Eclipse – 2 New Moons in LEO this year, flipping from early to late. MARS travels from PI to SCO in 2017 (not in retro until June – Oct 2018). JUPITER in LI (since Sept 9, 2016 to Oct 10, 2017 when it enters SCO). JUPITER retro on Feb 5, and direct on June 9 – Full Moon. JUPITER opposes URANUS in AR on Dec 26, 2016, March 3, and Sept 27, 2017. JUPITER squares PLUTO in CAP on March 30 and Aug 4. SATURN in SAG until Dec 19, 2017 when it enters its ruled sign CAP. SATURN retro on Apr 6, and direct on Aug 25. SATURN squares CHIRON in PI on Apr 30 and Nov 2. SATURN trines URANUS in AR on Dec 24, 2016, May 18, and Nov 11, 2017. CHIRON end of PI (enters AR for the first time in Apr 2018). CHIRON retro on July 1, and direct on Dec 5. URANUS end of AR (enters TAU for the first time in May 2018). URANUS direct on Dec 29, 2016, retro on Aug 2, 2017, and direct on Jan 3, 2018. NEPTUNE in PI (until 2026). NEPTUNE retro on June 16, and direct on Nov 22. PLUTO in CAP (until 2023). PLUTO retro on Apr 20, and direct on Sept 28. The first Day of Christmas, today Dec 26 is be the Day of ARIES, and / or the Day of PISCES. Would you like to tune in and see whether there is a message for you from those energies? Here is the whole line-up of dates and corresponding 12-Day Zodiac energy suggestions (forward and backward). Interesting that on Dec 31 to Jan 1, the energy switches from Libra / Virgo to Virgo Libra. The Virgo / Libra cusp that we are ‘dancing on’ on New Year’s eve has to do with Perfect Alignment. Of course, there is also the song “12 Days of Christmas” – and speculations about the hidden, encoded meaning of the ‘gifts’. Today and tomorrow, Dec 20 /21 are the shortest days of the year, and tonight (Dec 20 / 21) will be the longest night of the year in the Northern Hemisphere: Here in Victoria B.C. Dec 21 is 7 hours, 48 minutes shorter than on the Summer Solstice: 8 hrs, 18 min. and 33 sec. daylight. The SUN appears to ‘stand still’ (Sol-stice) for a few days, on the lowest arc of the Ecliptic, before slowly, gradually ‘climbing’ again, and providing minute by minute longer days (Dec 18 – 24: 8 hrs 18 – 19 min., then gradually longer daylight, see this Time & Date table and wiki Winter Solstice article. Today Dec 20 at 12:12 pm, our AstroEmbodiment Circle of Eight stepped into the energy field of the Winter Solstice chart! Here are some key themes that we ‘downloaded’ as we all stepped into the fields of several planets – with participants not even knowing what they represented (that’s the magic of the field!). The Solstice SUN – a calm, quiet energy field of simplicity. What matters matters. All else can wait. Deep immersion into the dark, infinite PLUTO / MERCURY retro regeneration ‘cave’. Not scary, rather ‘velvety’. In contrast: What an exciting, igniting, liberating, whoaaaa energy of URANUS in ARIES (presently a stationary ‘focal point’). Freedom for being oneself! JUPITER in LIBRA (and the Winter SoUlstice Moon next to it) – in opposition to URANUS – responding, balancing, dancing with URANUS, by offering an openness for new complementary relationships and synergies on all levels. LILITH in SCO: Moving not just ‘with the storm’ but being the storm, being Nature – magical and empowering. SATURN in SAG requires experience, practice, and a good grounding / lauching pad from which to fly – like a ski jumper. The North Node in VIR is also grounding and aware of alignment – yet responding to many influences (“so much to do?”). In balance: NEPTUNE, the South Node, and CHIRON in PI are the universality, where nothing is ‘to do’, all is interconnected and an interdimensional healing offer. The invitation to relax into this and receive its gifts. MARS in PI adds adventure, like surfers rolling with the waves. VENUS in AQ adds sparkle – and needs breathing space. Solstice Storm (the Sun low in the sky round 3 pm) – Photo by Melanie Dec 20, 2016. WINTER SOLSTICE 2016 will be exactly (as the SUN enters CAP) this year tonight, Dec 21 at 2:46 am PST. Balance is an important message – not only because LIBRA is the AC from the West Coast, but also the MOON and JUPITER will be in LIBRA (and the World has a big – JUPITER – need – the MOON – for Balance, Peace, Harmony, Fairness, Justice, and Right Relationships nowadays. JUPITER and the MOON in LIBRA oppose stationary URANUS retro in ARIES: The ‘wild card’ / revolutionary / unpredictability factor of URANUS in ARIES needs some calming and moderation. And the tendency of JUPITER in LIBRA to be overly other-oriented can benefit from some fresh ‘enlightened self interest’ and pro-active ARIES initiative. The North Node in VIR opposes (naturally) the South Node in PI, with NEPTUNE and also MARS approaching. A balance between relaxing, surrendering (MARS in PI: ‘Victory’ comes from surrendering the ego), letting go and Being in Oneness, and doing what’s in integrity, based on self awareness (VIR). MERCURY freshly retro (Dec 19 – Jan 8) with PLUTO in CAP asks us to go deeper into soul searching – what’s the deeper symbolic meaning, essence, and spirit of Christmas, SoUlstice, Light Returning – for us? And what is TIME? How can we work with what we got (yes, optimizing working with day light is a metaphor)? If we have health, time, community, access to resources, how do we work with all of this and them in the best way? MERCURY is presently in the first = epimethean phase of the retro journey. ‘Old stories’ – perhaps ‘inherited’ from the ancestors (CAP) might come up, to be acknowledged and transformed (PLU) into higher purpose. Maybe the old stories teach us / can be used as a ‘teaching example’ to show how empowering, evolutionary change is possible / already happened in other situations (like: the ancestors were resourceful and went through… how can me use their example, strength and endurance – without the struggle, scarcity,or even survival scenarios they might have gone through!). Our conditioned Mind (MERCURY) is going through a transformation (PLU). What comes up for you? Let’s go deeper, into our visceral incorruptible ‘gut’ sense of what’s going on and ripe for transformation and empowerment – symbolized by PLUTO. That’s where the Power-to-Change sits. Clearly, this MERC / PLU activation affects all you CAP friends out there, and the CAP sides (AC, MOON, Planets, and house) in all of us. Ask me if you’d like to explore these themes in your own chart and life with me. When MERCURY retro meets the SUN on Dec 28, just before the CAP New Moon on Dec 28 / 29 it’s time for new breakthrough insights that move us forward. More about the MERCURY retro phase, tips & tricks in this blog post. Ahh, that alignment makes it much easier – and spacious! – to be in our truth and on our path, matured from old beliefs conditioning, moralizing, and guilt-tripping ‘shoulds’. Free to show up in our authentic Self – hallelujah! For the SoUlstice time, I look forward to nature walks, and engaging in what brings joy and is regenerative – can be quite ‘simple’ says CAP. By the way, if you still haven’t seen it yet, or as a reminder – esp. apropos materialistic Christmas: Watch the 20-min video ‘Story of Stuff’ by Annie Leonard. She launched it 9 years ago(! ), in Dec 2007 (just before PLUTO entered CAP, in Jan 2008), to illustrate how the ‘material’s economy’s’ linear system of extraction -> production -> distribution -> consumption -> disposal is unsustainable on a finite planet, which I’m sure is pretty obvious to you, dear reader, but perhaps you’d like to show / send it to some rare ‘disbelievers’ out there. The project has evolved: In the meantime, there is also the ‘Story of Change’ and the Story of Solutions’. Historically, humanity has attempted to be the masters of time and productivity since PLUTO was the last time in CAP (late 1700’s, the times of the American, French, and Industrial Revolution, and major colonization, and ‘distribution’ of the world resources among imperialistic countries that subordinated and ‘ruled over’ indigenous cultures. The ever faster running wheels and productivity devices have turned against us. With all the opportunities that ‘saving time’ has brought us we have become the slaves of time (as scarcity). Many people are caught in the machinery and ‘live for retirement’, or impose our generation’s debt on the shoulders of the next generations. This is unsustainable. Change is underway. Too slow? Effective and transformational enough? Here is a random act of log wisdom that I found at a nearby beach (and left it there, for the next person): “Money, like manure, does no good until it’s spread around.” Not just money, any resource and what we can extract from deep processes wants to be ‘spread around’ now, with PLUTO in CAP, and SATURN in SAG. “The Work” is never done, we can’t personally be ever complete with what we set out to do. And as Joanna Macy would say: “Help create a project that survives you!” A transpersonal practice a la PLU. Did you know? 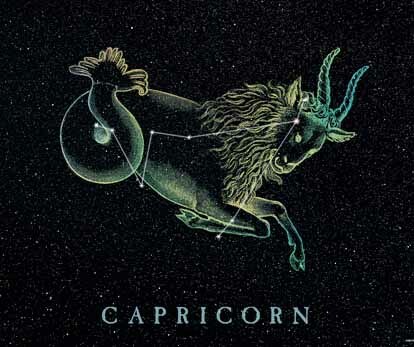 CAPRICORN is actually a mythical fish-tailed Sea Goat. The time of Winter Solstice when the SUN enters CAPRICORN has been traditionally (in the Pisces Age) celebrated as the birth of redeemers – masters who have climbed up the mountain of spiritual attainment, and offered their energy to the collective – the fish tail is an association with operating in the waters of Oneness. Which brings us to… Christmas! “…while Magi search the skies for mighty Jupiter and Saturn’s rings.”The (triple) JUPITER / SATURN conjunction in PISCES in the year 6 BC which was apparently considered the ‘Star of Bethlehem’ – the biggest planets in our Solar System aligned which happens (usually only once) every 20 year could have appeared as ‘A Star’. Apparently right overhead Israel (which is ruled by SATURN) at the time. JUPITER and SATURN united stands for the Archetype of a master / teacher / guru / king. And the fact that the Great Conjunction happened in PISCES at the onset of the PISCES Age promised a new religious / spiritual era. Hmm, goes to show, maybe Christianity knew something about Astrology, and ‘placed’ the birth of the redeemer onto Day 3 after Winter Solstice, when the SUN starts to gradually climb. Would you like to join us at the Winter Transits Parlour? That’s after the Holidays, on THU Dec 29 from 6:29 – 9 pm. Let’s honour and align with major astrological Winter transits into 2017! * MARS into PISCES (Dec 19 – Jan 27) Surf’s UP! Chill Out! ReConnect! Voyager Tarot card Man of Cups – Surfer. Crystal Activation and Photo by Melanie. Had fun fun fun today @ baking cookies (Lebkuchen and Baerentatzen = Bear Paws with dates), with inherited recipes of the Old World (from my grandma and from my dear old (since we were 5) friend Elisabeth’s Ma) while listening to Bavarian comedians. My mom had sent me CD’s years ago – timelessly funny, cool to tune into the humour and having a ball. Under MERCURY freshly retro in ‘Old World’ CAP (who refuses to buy cookies when she can make them, pricelessly infused with the right spirit), and MARS freshly in PISCES – yep, just rolled with it, and yes there was chocolate spilling, just on the right spots to be fun rather than a crazy mess. 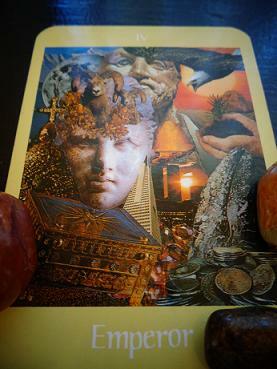 Picked a Voyager card to complete the still life / cookie altar: Nine of Cups – Passion – YES! On a personal level, MARS in PI is very conducive, together with MERCURY retro, to be on a roll and in the flow with anything that connects us with the bigger whole. And to let go and release what 2016 (a ‘9’ year of endings: 2+0+1+6 = 9) has ‘washed up’. In a pro-active, physical way, mind you, with MARS: Dance, music, shaking, breathing, swimming, surfing, sauna’ing, steam bathing, soaking in salt baths, or receiving body work that releases tension. All great ways of leaving 2016, and entering 2017 ‘freshly washed’ and re-connected. Yes, I get it, lots of people might want to drown their 2016 frustrations in alcohol and other drugs. Not the best outlet for MARS in PI. On a collective (= Piscean) level, MARS in PI can stir up an emotional unified, possibly even fanatical, ideally healing wave, since MARS in PI will contact NEPTUNE (on New Year’s Eve / New Year’s Day!) and CHIRON (on Jan 16). Which can turn into a powerful emergence of an innovative impulse, and / or a revolutionary activist movement when MARS enters its own Warrior energy of ARIES (Jan 27 – March 9) where it squares PLUTO (on Feb 22) and meets URANUS (Feb 26 – also the day of the PI New Moon Solar Eclipse!). So, for now, let’s RElax into collective high vibrations of unity consciousness beyond Time and Space, kick back, RE-connect, and enjoy the true Spirit of Solstice and Christmas! What an auspicious wintry time NOW for RE-lease and RE-generation, as we gather energy for the cosmic Spring energy from February on! These days, Dec 17 – 19 is the yearly time when (in the Northern Hemisphere) the SUN in late SAG points to the heart of our Milky Way Galaxy – the Galactic Centre, a dark rift, ‘black hole’, AND a birthing place out of stillness, energetically honoured by indigenous cultures as the Womb of Creation. On the Winter Solstice intersection of SAG / CAP, we are also at the Space-Time cross(roads). We increase the odds, as it seems, when we are in resonance with the Universe, in other words, when we follow inner guidance, the inner teacher that is connected to the bigger sphere, or even ‘simpler’: when we are in egoless alignment with integrity as-nature, and move with LOVE. Johfra Bosschart: Jupiter Rules Sagittarius. The Sagittarian Centaur is from the waist down a horse with a human upper body. He shoots his arrows from the heart to the heavens. The nature – animal – human – divine continuum. All in ONE. The Winter SoUlstice Point is also the Space-Time Point, Integrity Point, or Inner Guru Point where we can find the teacher and guiding light within. SATURN, the ‘obstacle bringer’ that teaches us via ‘what’s in the way’ (hint: old patterns and conditionings, fears and limitations, ego contraction, sense of separateness, and need for control) to drop that excess ‘baggage’ of these heavy duty engagements, is now in SAG (until Winter Solstice 2017), and was just passed by the SUN (on Dec 10). Ganesha – Elephant headed Hindu god, known to be the ‘Remover of Obstacles’ on the path, and Guru that takes us from the darkness (of not seeing what the obstacles is / was) to the Light. ‘After’ the Galactic centre, the SUN will reach the sacred SAG-to-CAP transition, at WINTER SOLSTICE. The WINTER SOLSTICE Point is the ‘Space – Time’ Point’ / ‘Integrity Point’ and ‘Tree of Life Point’ in the Zodiac. SAG rules Space, and CAP rules Time. Ancient teachings and deep inner guidance come to life here. Let’s link up with that potent energy that’s available, at this time of year. Space as we knew it changed irreversibly (Internet, globalization, worldwide travel expansion etc. ), during the period when PLUTO was in SAG (1995 – 2008). Time as we know it is changing now, with PLUTO in CAP (2008 – 2023). Time is VERY relative, in fact it’s just a dimension that can be also molded, and transcended: We energetically ‘run out of it’ when we race around in scarcity mode, and, with consumer mentality, want more of what we don’t seem to ‘have’. Like a ‘hungry ghost’. The shadow of CAP (never satisfied materialist). In contrast, we ‘have all the time in the world’ when we slow down, and tune into ‘Kairos’ (time-as-quality) rather than ‘Chronos’ (time-as-quantity). When we tap into ‘Deep Time’, and tune into Heart Time… One of the best gifts we can give others, to ourselves, and to the World. A theme that’s up now big time 🙂 under MERCURY to go retro (on Dec 19, now in ‘storm’) in CAP, next to PLUTO! One of my all time (pun intended) stories (would make a beautiful Holiday RE-read) is Michael Ende’s Momo. In the village where Momo lives the pace of time goes very slowly. Nobody’s stressed, and everyone has time to chat and rest – until the day the grey men arrive. With a great selling strategy they offer the people an account to collect time…. Here’s the movie version in English. Heart Blessings for this Sacred and Deep Time of Year!